Digital Marketing is a new and upcoming career option. A usage of Internet is growing exponentially. Print media, News Paper, Radio and Normal television are outdated. Most of the people use Internet, Mobile and Smart TV with YouTube, Netflix and Amazon Prime. This transition and increase in Internet usage has given birth to new career “Digital Marketing”. A digital marketing means marketing of the product by using digital media mainly internet. It is a hot and happening career option where product advertisement or promo is delivered via digital channels such as search engine, websites, social media, e-mail, mobile apps etc. The person involved in doing digital marketing is called as Digital Marketer. As a digital marker you need to learn following things. There are numbers of institutes that offers Digital Marketing Course in India. If you are confused that which institute is best to join, here is Best Certification Digital Marking Course in India. These courses are shortlisted based on course content, duration and fees. Digital Vidya is one of the oldest digital marketing institutes. It is leading digital institute in India. Digital Vidya offers Certified Digital marketing master course (CDMM) which is an online course for 3 or 6 months. Digital Vidya is an official training partner for Google India. The cost of marketing course by this institute is Rs. 49,900 + 18% GST. The course content includes search engine optimization, social media marketing, email marketing and web analytics. Digital Vidya also offers specialized marketing courses in digital like Facebook Marketing, Mobile Marketing, Affiliate marketing etc. All these course are offered with 100% money back guarantee. Digital Academy India is powered by Digital Vidya. Digital Academy India offers 5 month course. A complete course is online and offered with Rs.34900 + 18% GST. Most of the trainer offering this course are Google Certified. The training course material provided by Institute is very good. This academy also offers course in Corporate digital marketing. UpGrad is next in the list of best digital marketing course provider. UpGrad provides high quality course on digital marketing. Apart from this course UpGrad also provides other programs. UpGrad’s program is in association with MICA. UpGrad provide two certificate program on Digital market namely PG Certification in Digital Marketing and Executive program in strategic marketing digital. The course is online and duration is 6.5 months. This course is slightly expensive. You need to pay Rs.79500 Plus Taxes. Edukart is leading education market place. Edukart offers various courses where few courses are related to digital marketing and advance digital marketing. You can avail very good discount using Edukart portal. The course are in the range of Rs.5000 to Rs.50000. The courses are offered by Internet & mobile association and Digital Vidya. Institute of Digital Marketing is famous as IDM. IDM offers 15 different types of marketing course such as certificate in search engine marketing, social media marketing, content marketing, e-mail marketing, mobile marketing etc. Experienced trainer, free course material and free courses are major advantage of IDM. Operating Media is a leading digital marketing institute in Mumbai. The online digital marketing course offered by Operating Media are SEO, SMO, Analytics, WordPress etc. Operating Media provides personalized training in flexible batches. The course price is in the range of Rs.12000 to Rs.30000. Delhi School of Internet Marketing is famous as DSIM. DSIM offers Masters in Digital Marketing. DSIM is also involved in doing corporate training, campus learning and in class training. Prior to joining actual course you can also take demo course. It is one of the costliest course. The fees of this course is Rs.70,644. There are numbers of colleges in India that offers MBA or PGDM in Digital Marketing. The course duration is 2 years and approved by AICTE. It is complete classroom type course where fees are very high. You need to complete course and appear for exam to become MBA in digital marketing. Some colleges keep condition to clear CAT exam before joining this course. NIIT also offers digital marketing program. You can become certified digital marketing professional by attending this program. It is one of the best course. The course content includes SEO, Digital display advertising, email marketing, mobile marketing and analytics. It is 33 hours course. The cost of this course is Rs.37500 + 18% GST. Manipal Global Education also offers Digital Marketing program. It is called as Manipal Prolearn. The knowledge partner of this program is Google. The course content includes creation of website, fundamental of adwords, search advertising, video advertising using Youtube, Advertising on mobile etc. In short course content more or less deals with Google advertisement program. The plus point of this course is it is available as online as well as offline model. The cost of online module is Rs.30000 while for classroom module you need to pay Rs.39000. If you want to be google certified professional you should try this course. Digital Marketing Course is recommended course for everyone like students, entrepreneurs, marketing professional, bloggers, startup, web designers, housewives and IT professional. 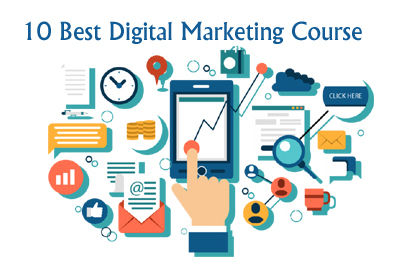 Hope you have got complete information about 10 Best Digital Marketing Course in India.